Research conducted in Malawi revealed that circumcised men were the ones with a high prevalence of HIV rate in Malawi, Malawi24 can reveal. The research which was conducted long before the championing of the circumcision campaign dispelled the assumptions that circumcision reduces the chances of contracting HIV, the virus that causes AIDS. A document which Malawi24 has seen and throws back to a 2010 research on the prevalence rate of HIV among Malawian men established that over 10% of Malawian men who had undergone circumcision were HIV+ compared to only 7% of uncircumcised men. The report dubbed The Malawi Health and Demographic survey states on page 207 that the prevalence rate of HIV was higher among circumcised men that the uncircumcised in Malawi. However regardless of these statistics the World Bank went ahead to pump $15,000,000 (about MK7 billion) into circumcision campaign for Malawian men when research had proved to them that circumcision did not reduce the chances of Malawian men contracting HIV rather it made them high. MK7 billion is an equivalent of the money that was set aside in the 2014/15 national budget for buying of drugs in hospitals that could have prevented Malawians from dying unnecessary deaths. Money allocated to the infrastructural developments in Malawian Universities and building of new Primary school blocks as well as teachers houses when combined in the same budget could not total the K7 billion. 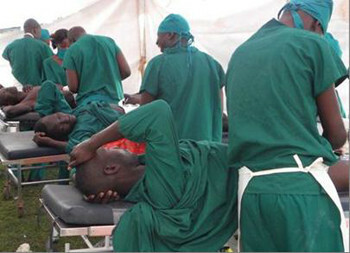 Recently medical male circumcision has been embroidered in controversy as it has emerged that most men had contracted the HI virus after being circumcised because they had been told that it would reduce their chances of contracting the virus.